Marisa Viggiano prepares to kick the ball. The senior midfielder played many keys passes during the game. As Northwestern advanced across midfield repeatedly during the second half, the pressure grew greater and greater. It was visible in the faces of each of the eight players who missed a shot in those 45 minutes, as none of them broke the tie. The No. 14 Wildcats (8-3-2, 2-3-1 Big Ten) had 10 more shots and six more corners than Rutgers (8-1-4, 4-0-2) in the second half Thursday night, but the Scarlet Knights converted in overtime and claimed the 1-0 win in Piscataway. NU’s inability to take a lead troubled everyone on the field, especially coach Michael Moynihan. “There was a handball we could have had, a time when (senior defender) Kayla Sharples was taken out on a corner kick and the call was against us,” Moynihan said. The closest opportunity for the Cats came in the 75th minute, when Sharples received senior midfielder Marisa Viggiano’s cross less than a foot from the goal. But her header and follow-up were both deflected, as was everything else NU sent at Rutgers’ extremely compact defense. 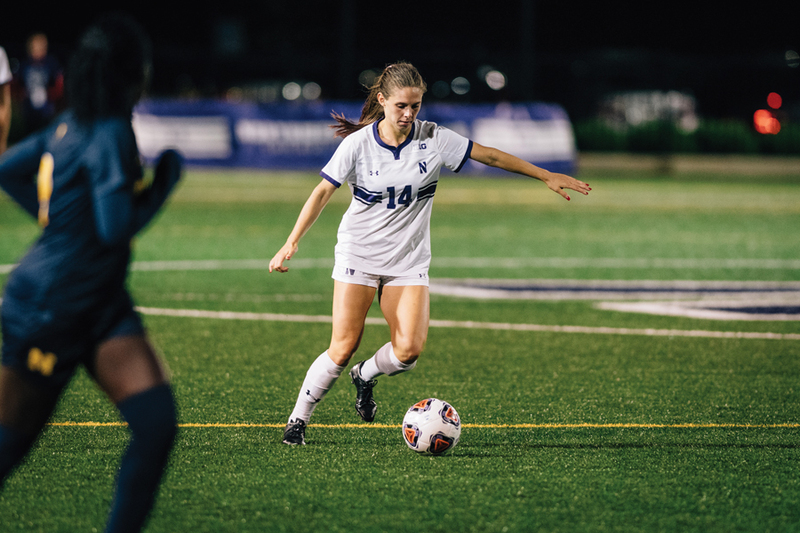 Sharples had three shots and senior forward Brenna Lovera had four, but Rutgers forward Amirah Ali ended the game with an off-balanced, left-footed shot that bounced underneath diving freshman goalkeeper Mackenzie Wood and into the net. After 90 minutes, the two teams’ sidelines could not have looked more different. Heading off the field, a few Cats encouraged sophomore forward Kayleigh Stahlschmidt after she missed a contested shot from the left side of the box with less than two minutes to go, but other than that Moynihan said there wasn’t much discussion on the sideline. Meanwhile, Rutgers sprinted towards the sidelines, looking more energetic after making it scoreless through 90 scoreless minutes against a top-15 team. Even though NU had come so close to ending the game several times in the last few minutes, Viggiano said the team wasn’t dejected about having to go back onto the field. In the six minutes of overtime before Rutgers scored, the Cats generated two corner kicks but no shots on goal. NU’s senior class hasn’t beaten the Scarlet Knights since they were freshmen. The loss results in NU falling to eighth place in the Big Ten, while Rutgers jumps to first.